The Lesser Kestrel (Falco Neumann) is everywhere. Nesting in cavities in the pigeon houses as seen previously, they hunt in the plains, looking for prey from elevated and exposed perches, such as trees, pylons, rocks or fences. Here we can see a female. She has paler and browner head than male. 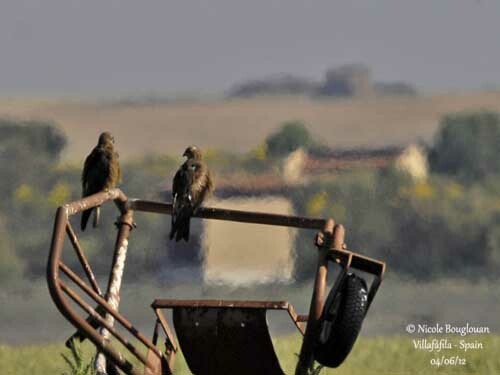 Following the narrow road across the fields, we meet two Common Buzzards (Buteo buteo) fighting for the same perch. They are numerous in this area because the preys are abundant and mainly the small rodents. 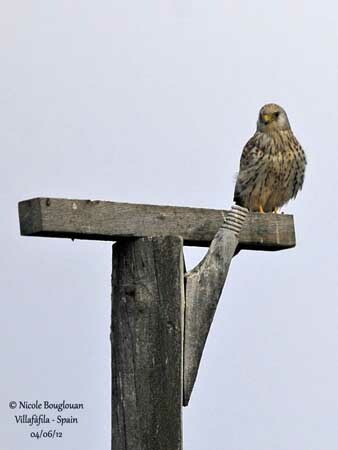 This raptor hunts usually from perch. When the prey is located, the bird glides down to the ground and catches it. It may fly low over the fields and walk sometimes, watching for large insects. These birds of prey will accompany our visit during two days in Villafáfila. 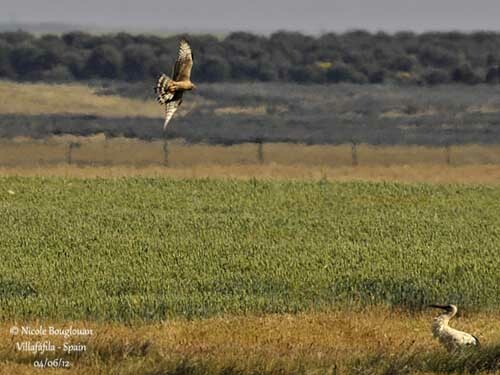 Some Montagu’s Harriers (Circus pygargus) are hunting too, flying with agility above the ground, turning and diving abruptly when the prey is detected. 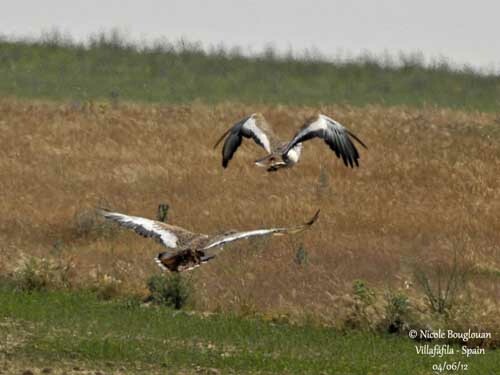 Here, a female is flying above a White Stork which appears very upset of this disturbance while it is foraging! 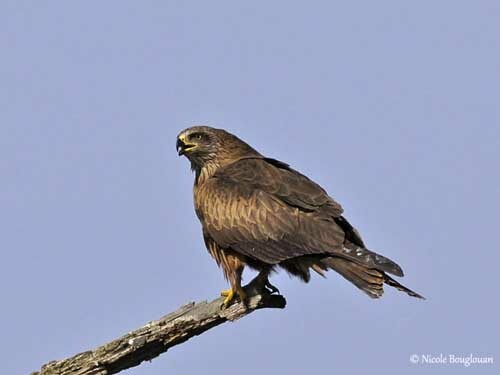 The Black Kite (Milvus migrans) is another migratory species. This powerful raptor winters in Africa, south of the Sahara. It feeds mainly on carrion, debris or fish found along roads or streams. 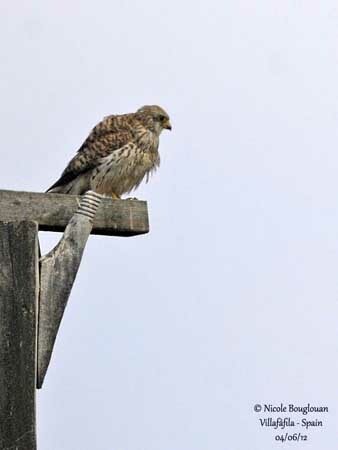 Very common, they are often seen in groups, perched in the countryside and even in towns. At this moment, the young are leaving the nest and follow the adults. They return to Africa in August. And of course, the Booted Eagle is visible in all parts, flying and gliding, searching for preys. 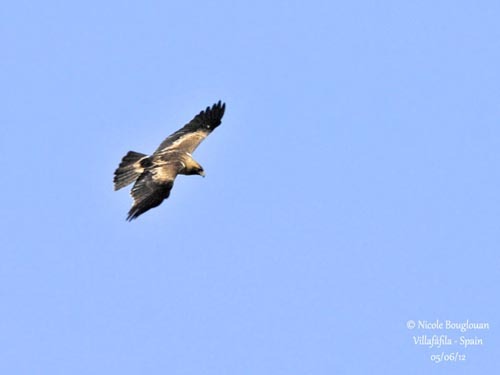 This beautiful but small eagle may be sedentary in southern Spain, but most of them migrate to Africa in winter. All these birds of prey are necessary for the nature’s balance. They are today less persecuted, and humans have finally understood their usefulness! 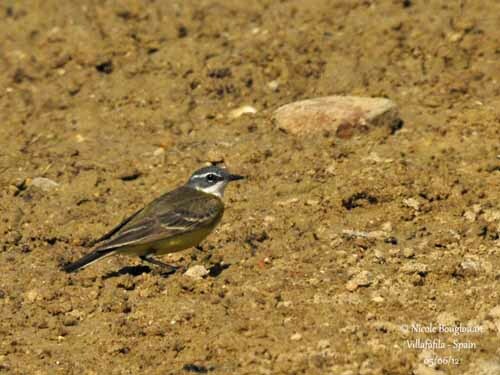 While crossing very dry areas, we can see some birds along the shores of the lagoons, today completely empty. The winter is the best season to visit this region. 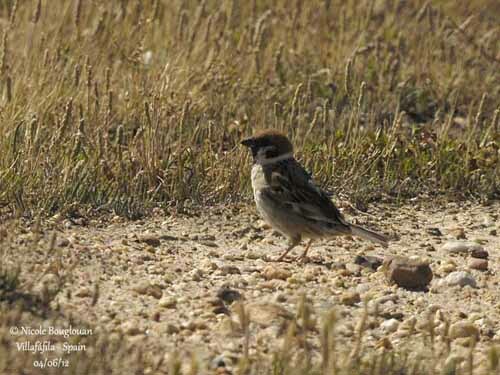 The Eurasian Tree Sparrow (Passer montanus) is walking on the bottom covered with cracks, while a Crested Lark (Galerida cristata) is running through the grass. But some kilometres later, we are surprised to see that a small pool is full of life! This cool place is surrounded by some reeds. 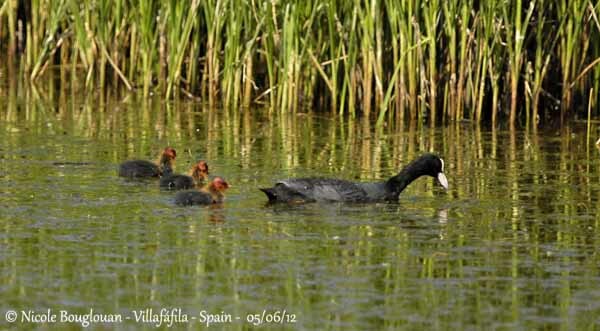 A family of Common coots (Fulica atra), two adults and three chicks, are swimming and feeding quietly. The chicks follow their parents, and still depend on them for food. 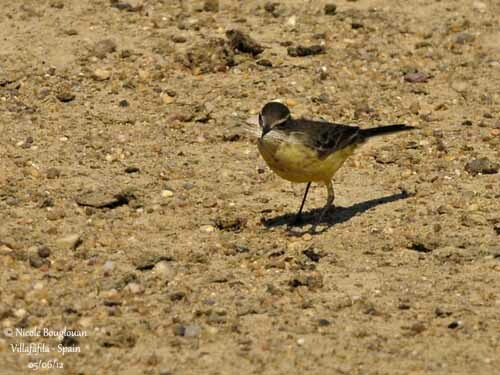 On the shore, a pair of Yellow Wagtails (Motacilla flava iberiae) is walking on the sand. The male seems to be guarding the female, following her carefully. Actually, she is collecting nest materials and the male assists her in this duty. This species nests in tussocks and often near water. They are so busy! Even our presence does not disturb their works! 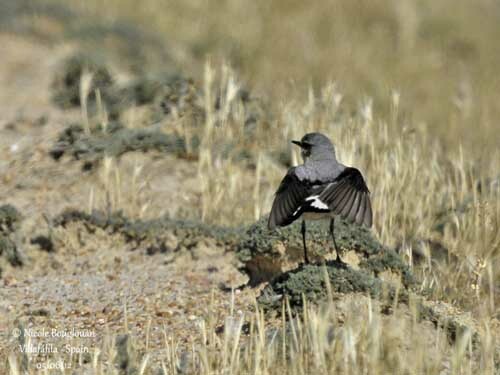 The race “iberiae” has grey crown and nape, white lower cheeks, chin and throat, white supercilium and black patch on upper cheek. The male is darker than the female. 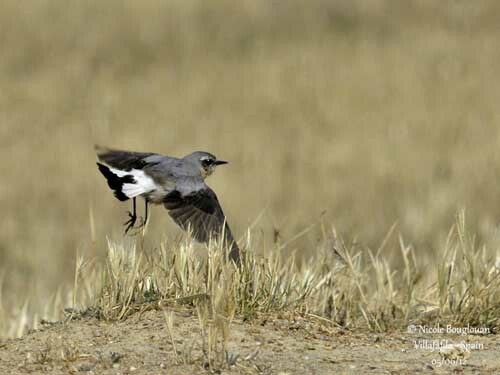 A Northern Wheatear (Oenanthe oenanthe) is drying its wings after a good bath in this fresh water. It is in breeding plumage, showing its contrasted colours, and the typical tail pattern. This insect-eater is here in suitable habitat for this behaviour. It nests in rock crevice, a small wall or on the ground. 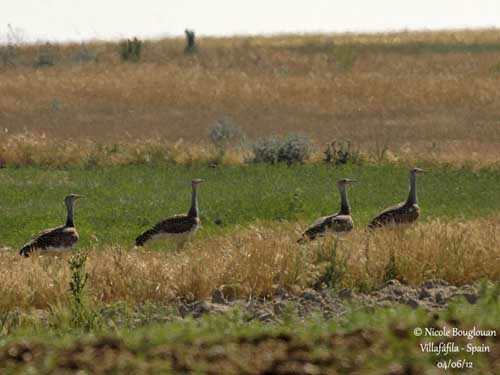 The Great Bustard (Otis tarda) is one of the heaviest flying birds of the world. 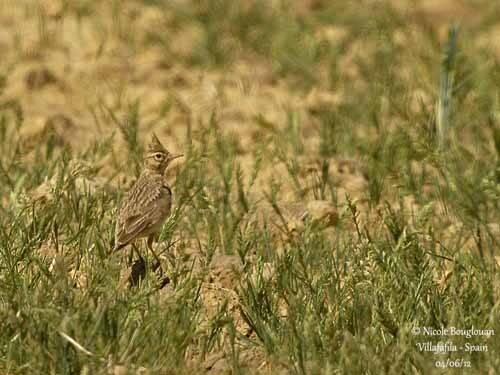 This imposing bird is an important part of the Spanish steppes and plains. 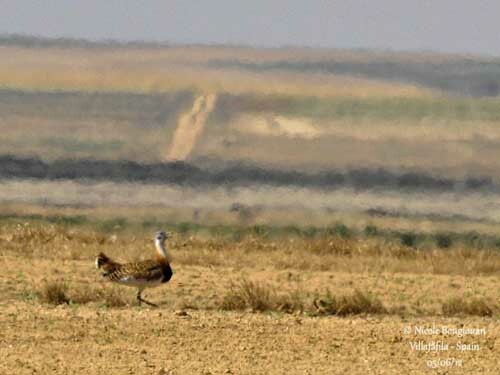 We can see its high silhouette walking quietly in the fields, taking some insects while foraging alone or with several other bustards. Usually, the groups are unisex. Male and female only meet during the displays in breeding season. Our first sight is a group of four females or immature birds. The light is very hard and that is difficult to see them perfectly. They take off some minutes later, in spite of our motionless attitude. This large bird flies very well and quickly. We return the following day, and we can see several males but fairly far from us. They forage together in tall grasses. Sometimes, they disappear into the corn fields and we only see their heads. I wish to finish this report with this amazing bird. This one is walking very slowly along the cultivated fields. It is midday. The sun is high in the sky and the light almost white. Far off, the landscape is similar to an impressionist artwork. The Great Bustard is at home!